Our Contemporary Bar Stool offers fine lines perfect for a minimalist home! Select a bar stool height that works for your home, available as a dining bar stool (24") or a bar height stool (30"), this stool is a great option to be used as a kitchen bar stool by your kitchen island. 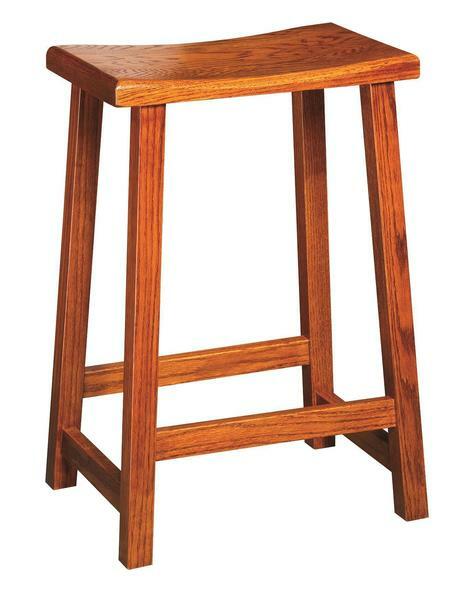 Crafted by skilled Amish craftsmen, this Amish Contemporary Bar Stool can be crafted with your choice of solid wood: Oak Wood, Wormy Maple Wood, Quarter Sawn White Oak Wood, Cherry Wood, Hickory Wood, Hard Maple Wood. This backless barstool comes standard with a scooped solid wood seat or can be customized to have an upholstered seat with bonded leather fabric. Finish the look of this contemporary dining bar stool by selecting a finish that matches your home style. They turned out beautifully and I'm already getting compliments. The bar stool fabric is fine. The seats are very narrow though. They are 10" x 16". I would like to order one more extension, without skirting, for my table. I realize the stain may not be a perfect match.